China published figures Thursday regarding its trade surplus and they were far better than expected. Some say that this may be the tell-tale signs of the proof that the economy is stabilizing. But, only a few weeks ago there was worry that the Chinese economy was contracting, that it had no liquidity left and that the banks were failing. If it only takes a few weeks for there to be a turn-around in events that were seemingly catastrophic, then they had better patent, package and market the recipe for success and the world will buy into it like they have never done before. 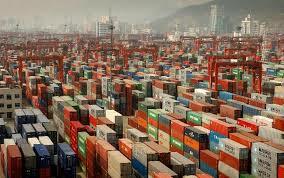 Imports into China increased 10.9% ($168.2 billion) in July 2013 and that was nearly five times more than the 2.1%-rise that had been expected by analysts. In June there had been a 0.7%-drop in imports into the country. The world’s second largest economy saw exports rise by 5.1% for July 2013 ($186 billion). Analysts had only predicted a 3%-increase. It was also far better than the fall that had been experienced in June of 3.1%. Consequently, the data showed that the trade surplus stands at $17.8 billion, rather than the $27.2 billion that the market had been waiting for; that’s a drop of 29.6% (year-on-year). Imports increased far more than exports for China in July. The date shows that for July there is a rebound in both external and domestic demand for China and analyst believe that this may be a sign that the Chinese economy has reached the lowest ebb of its fall and finally bottomed out. If figures are confirmed this month, then the Chinese economy may accelerate in the third quarter of this year and show healthier signs of a stronger economy. Some have said that the results are ‘surprisingly good’ and that may be cause for concern over the veracity of the data. It is astonishing that any government measures have filtered through in such a short period of time in China and have had an effect on the trade surplus, managing to increase imports so much. The Chinese administration decided to crack down and try to halt capital in-flows to China that were disguised as exports, largely fearful that this would cause inflationary pressure. However, for there to be such a strong effect in just a short-space of time leaves the results open to question. In the first quarter of 2013 year-on-year growth for exports stood at 18%. But, with adjustments and after subtracting the illegal capital flows that were made up to look like exports that figure fell to just 5%. According to analyses by the International Monetary Fund, global falls in growth mean that China will suffer the consequences in its own economy also. In 2013, global growth is estimated at just 3%. Emerging markets are suffering from subdued demand and have meant that the figure has been reduced and also the Eurozone has brought about more problems due to its recession. China’s growth is estimated at 7.75% for 2013-2014, which is almost half a percentage point lower than the figure that had been put forward in April this year. However, despite the positive market reactions and the currency fluctuations that are taking place, Friday will be the real test of nerves of the market as data is released from China regarding inflation, industrial output and retail-sales figures. This will be a far clearer picture of the state of the Chinese economy than anything else and the trade surplus does not indicate that the country is out of the danger zone of contraction quite yet. Volatility from month to month regarding trade figures is always the case and at any rate the Chinese are renowned for being rather poetic with their trade date and it is quite hard to know where the reality of the situation is. Any trade data coming out of China needs to be looked at carefully and sometimes taken with a pinch of salt, especially when there is such a big difference between figures predicted by analysts and those that are issued by the Chinese administration. Such big differences certainly leave one thinking that the data is not entirely real. Tomorrow’s figures that will be released will show the real state of affairs of the Chinese economy and whether or not it is indeed improving now. But, whatever the data shows Friday, the structural problems in China are still going to be lurking behind them. The problem of shadow-banking has still not been resolved and capital allocation remains a problem in the country. Until those structural problems are also dealt with, the economy is not going to be running freely and there will be doubt in the minds of investors.